Crestron “build[s] the technology that integrates technology,” according to its corporate website. Crestron has more than 90 offices that provide around-the-clock sales, technical, and training support across the globe. In addition to its world headquarters in Rockleigh, N.J., Crestron has sales and support offices throughout the U.S., Canada, Europe, Asia, Latin America and Australia. Sometimes referred to as an automation manufacturer, Crestron certainly is that but it’s offering now sprawl across just about every product category touching the AV integration industry. Crestron is a leading provider of home-, building- and workplace automation solutions. Its control and automation solutions include control system hardware, touch panels, keypads, remote controls, building & enterprise management hardware, control systems, control modules and more. As workplaces has evolved so too have the multimedia needs of meeting spaces. 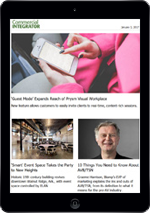 It’s increasingly important for employees to be able to quickly assemble and share or present content from their devices, e.g. laptops, tablets, phones, etc. Crestron AirMedia is a wireless presentation solution that debuted in 2014. 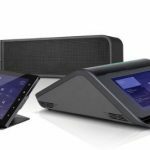 The manufacturer unveiled the next generation Crestron AirMedia 2.0 wireless presentation solution at Integrated Systems Europe 2018. Crestron “integrates systems and technologies that typically operate in silos, so they work together as a single system,” according to its website. It includes network room scheduling, remote help desk, global device monitoring and data collection and reporting. Crestron is renowned in the AV integration industry for its training and certification programs. Only trained and certified professionals are green-lit to work professionally work with Crestron products. Only Crestron Certified Programmers can program Crestron automation systems. 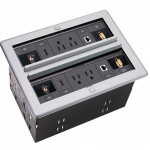 According to Crestron’s website, this track is designed for technical installers and integrators who work with Crestron systems. This track is designed for AV Professionals who configure and maintain Crestron systems and technicians interested in making the transition to engineer. This track is for AV industry programmers who seek to earn the respected title of Crestron Certified Programmer. On its website, Crestron notes that successful completion of this track leads to Crestron Certified Programmer accreditation. A Crestron Certified Programmer holds the highest respect in the industry due to the rigorous training, extensive experience, and stringent testing throughout the certification process. 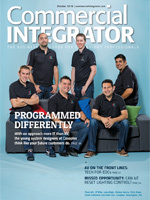 Certified Programmers earn an exclusive invite to our yearly Masters Classes. Masters Classes are an invaluable opportunity for programmers to obtain specialized, hands-on training for the latest Crestron software and hardware while networking and sharing knowledge with other members of the Crestron Certified Programmers Community. 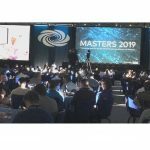 Crestron launched what became the Certified Masters program as a continuing education program for its certified technicians in 2001 and invited the 30 or so people to a training event. That has grown leaps and bounds turning Crestron Masters into an industry standard event, most recently with 900 attendees. Many integrators in the AV industry wonder why more manufacturers haven’t matched Crestron’s level of commitment to training and certification. Learn more about Crestron training and certification opportunities here. Multiple Crestron meeting & room scheduling products have won awards from CI. The Mercury Tabletop Conference System & touch screens each made the list of Most Innovative Meeting Spaces Products. Crestron Mercury uses existing network infrastructure to call, present, and video conference all from this one tabletop console. 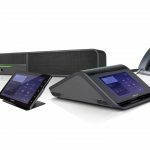 Crestron Mercury is a full open SIP conference phone and features a high-performance built-in speaker and four microphones; supports all web collaboration services, and connectivity for wired and wireless presentations. Cloud provisioning makes large-scale deployment and management easy. Crestron Room Scheduling adds a level of productivity for organizations with multiple conference rooms and meeting spaces. Crestron Scheduling Touch Screens connect directly to Microsoft Ex- change or other popular calendaring programs, such as Google Calendar or IBM Notes, to book impromptu meetings on panels outside of rooms or search for and book spaces based on location, number of attendees, and type of meeting. The AVI-SPL Challenge proved that it’s about time that interactive experience at AV industry events go far, far beyond a claw machine at a vendor booth. As of Crestron Masters 2019 there were 12 Crestron Masters Diamond Level members. Learn about this elite group. 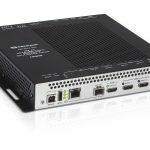 With addition of Pixel Perfect Processing for image quality “as good as PC direct over standard 1G,” Crestron announces next generation DM NVX network AV via free update and new products.